Japanese stocks soared Monday as the dollar reached a four-month high against the yen, but most other Asian markets were hit by worries about the impact of Donald Trump's presidency on global trade. Equities around the world have seen volatile trading since the tycoon's shock election win, with his pledge of big-spending measures and tax cuts leading to predictions of a surge in inflation and higher borrowing costs. The prospect of better and safer returns in the US has also led to an exodus from emerging markets and currencies, while the Mexican peso is also struggling owing to concerns about Trump's warning he will tear up a key trade deal. 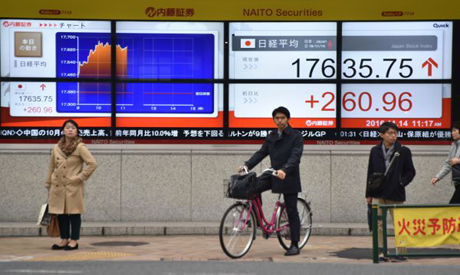 Tokyo's Nikkei ended up 1.7 percent, with exporters rallying on the back of the weakened yen. The dollar was at 107.61 yen, its highest mark since July. "The Federal Reserve now face the conundrum of rising inflation expectations," Chris Weston, chief market strategist in Melbourne at IG Ltd., said, according to Bloomberg News. "What we saw last week was a genuine change in the thought process of many money managers, with some feeling we need to be prepared for inflation, while many others have been truly sceptical of the moves and note that while markets are firmly in the 'hope' phase there are great execution risks." Japanese investors were also lifted by news the economy grew more than expected in the third quarter as exports offset slack consumer spending. Wellington gained 0.5 percent as a deadly earthquake in New Zealand's south island boosted construction firms on expectations of a rebuilding programme. Shanghai put on 0.5 percent despite data showing below-forecast retail sales and industrial output for October. However, Hong Kong sank 1.4 percent, extending a heavy loss on Friday, while Seoul and Sydney each shed 0.5 percent and Singapore fell 0.9 percent. Manila dived 1.5 percent and Jakarta was 1.8 percent lower, with dealers concerned Trump's protectionist rhetoric could see him throwing up tariffs. The prospect of higher US interest rates battered higher-yielding currencies last week and on Monday South Korea's won was down 0.6 percent, the Philippine peso fell 0.5 percent and the Thai baht lost 0.1 percent. "Asian currencies continue (to come) under almost universal pressure in the aftermath of Donald Trump's victory in the US presidential elections as traders bet that an isolationist and protectionist presidency could harm the region," Greg McKenna, chief market strategist at CFD and FX provider AxiTrader, said. The dollar was also at record highs against the Mexican peso. The peso and Mexico's stock market have been hurt by fears Trump will follow through on campaign pledges to renegotiate the North American Free Trade Agreement, as well as pressure the country to pay billions of dollars for a giant border wall. Oil prices remained under pressure after OPEC said last week it pumped a record amount of the commodity in October, while dealers are worried the producers' cartel will not be able to implement an earlier agreement to cut output. In early European trade London and Paris each added 0.9 percent and Frankfurt put on 0.8 percent.